Perfect for our downstairs by the pool table. Great quality! 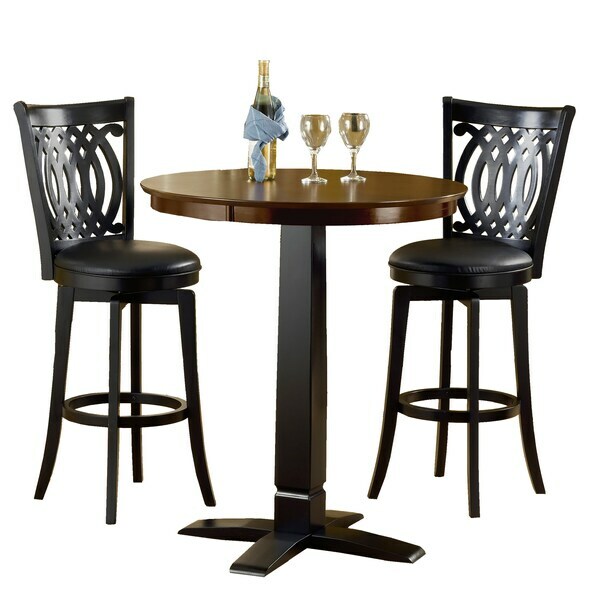 This versatile three-piece pub set is a modern classic that adds sophisticated style to your den or bar area. Featuring a round pedestal table and two swivel bar stools, this three-piece pub set offers a comfortable seating solution for relaxing with food or drink. Constructed of a two-tone black and brown MDF rubberwood veneer with black faux-leather cushioned seats, this set effectively combines comfort and durability. My husband and I just moved to a new home with a small galley kitchen. This is the perfect set for the two of us. Although a little tricky to assemble, it's a sturdy set and the seats are very comfortable. It is a perfect size for my small kitchen space. The table and stools are very sturdy. i would recommend this pub set for many spaces such a recreational room, breakfast nook, or even a corner in the bedroom for morning coffee. I just finished assembling this set. The photograph does not do it justice. It is really beautiful and a great value for the price. It is quite heavy and sturdy. It was also very easy to put together. We are quite happy with our purchase. All in all, it's a nice set, but it came with 1 of the 4 table top mounting bolts completely bent out of position. I was able to straighten enough to use. Did not want to deal with having to send it back, but I should have. I was skeptical about ordering but I'm glad I did. It's very sturdy and true to the picture. Very nice set! "what is the shipping weight of this item"
Hello kerchel, this weighs approximately 25 pounds. Thanks for shopping with us!